Finals, graduation and desperate subleases always mark the end of the semester and the school year. If you’re like me, the end of the semester means you anxiously check your bank account, see a desolate grand total and think, “F—k, my financial aid is gone.” You instantly regret your reckless purchases of “bottomless” mimosas at brunch and caffeinated Starbucks splurges during midterms. Turns out your “Pell Grant” isn’t bottomless. Unfortunately, “free” money runs out too. Oh, yeah, and did I mention rent’s due in a week? Stomach drop. College kids, don’t panic. You’ve been through this a few times before, so you know the drill. Desperate times call for desperate measures. Time to pull out the old coin bin and turn to your wacky money saving methods to save you. The first of the month rapidly approaches, and as you gaze into your empty pantry, you try to decide what’s more important—food or a place to live. As you mull over this predicament, your stomach growls through the agony. The brainstorming begins as you dig through your fridge, deciding how to make a meal out of half and half, a small bag of baby carrots and a leftover ketchup packet. After that recipe inevitably fails, you remember a box full of coins you stashed under your bed. Better yet, you saved quarters and now you’re four dollars and 75 cents richer. If this serendipitous occurrence drops in your lap, head on over to the nearest vending machine and celebrate with a bag of pretzels. That should keep you somewhat full until morning. Before college, you took necessities like food for granted because you never or rarely paid for them yourself. Suddenly, however, Publix’s BOGOs became unappealing, because spending five dollars on a meal wasn’t worth losing your month’s rent—even if it was just five dollars. When financial aid gets sucked dry, college students not only become desperate and broke, but they transform into slick thieves. “When I lived in the dorms, I stole from [FSU’s Dining Hall] Suwanee. I took entire milk jugs, oranges, bananas, cereal and they have a gluten-free table I would take crackers from,” said an FSU alumna*. Tsk, tsk, tsk…but you gotta do what you gotta do. You start committing to the phrase: If it’s free, it’s me. Because you and your peers treat grants and loans like a life raft in the middle of the ocean, you grab any coupon you find and always get the best deals possible. You ask the question “Do you offer student discounts?” too often and only eat if you hear the word yes. “I was always broke, but [I] never went out or bought anything for myself. I lived off free food coupons [from] restaurant openings like Apropo, and you eat free at a lot of places for your birthday,” said FSU alumna Amanda Rodriguez. It’s all fun and games when your wallet becomes heavy with financial aid to pay for your Chipotle, but when it’s gone you just get stuck with a purse full of coupons. You can’t recall a time when bae neglected to help you. So when you run out of financial aid, you know they have your back (and your heart) even if date night goes from Ruth Chris to Netflix and chill. “I’m really lucky I have [my boyfriend] to help me with food and what not, otherwise I’d probably be going to the dollar store all the time. [He] literally would pay for all the food and I felt so bad, but he also has a job and receives a stable monthly allowance from his family,” said Tallahassee Community College junior Moriah Munk-Madsen. If your significant other takes one for the team and spots your midnight McDonald’s craving, hold onto bae tighter than you tried to hold onto your financial aid. If you find it impossible to go a day without Starbucks, then you’ll understand the pain of replacing your expensive caffeine boost with an apple you bought for a dollar. You suddenly acknowledge that your foolish habits of wasting your financial aid was not worth replacing your morning pick-me-up with a fruit that barely even wakes you up. Your bank account (and energy) drains as you groggily pass by the coffee shop on campus. You hold your breath because you can’t handle even the smell of a delicious bold roast without offering the barista your watch in exchange for just a small cappuccino. As you put your tired head on your desk in bio lecture hall, you realize you screwed up and you didn’t even need coffee to tell you that. So you’re broke and shouldn’t be eating out, but you think it won’t hurt to get a side at least. You scan the menu and ah-ha! The fries only cost $2.69. With three dollars in your pocket, you decide to swing it. While your financially-sound friends munch on their huge, mouth-watering burgers, you slowly nibble on each crispy golden fry, trying to make this meal last. When the server drops the bill in front of you, you realize that even with a measly 15 percent tip, your grand total would be about $3.15. I’m not a mathematician or anything, but I’m pretty sure you have to skimp on the tip. Awkward. You’re on your last roll, and you hold your pee as long as you can, but one day you finally get to the dreaded brown circular cardboard. You decide to use your apartment complex’s clubhouse restroom, and discover something—they don’t lock their toiletries. You begin to stuff as many rolls as you can in your backpack. You feel bad, but anyone who trusts broke college students could use a reality check. 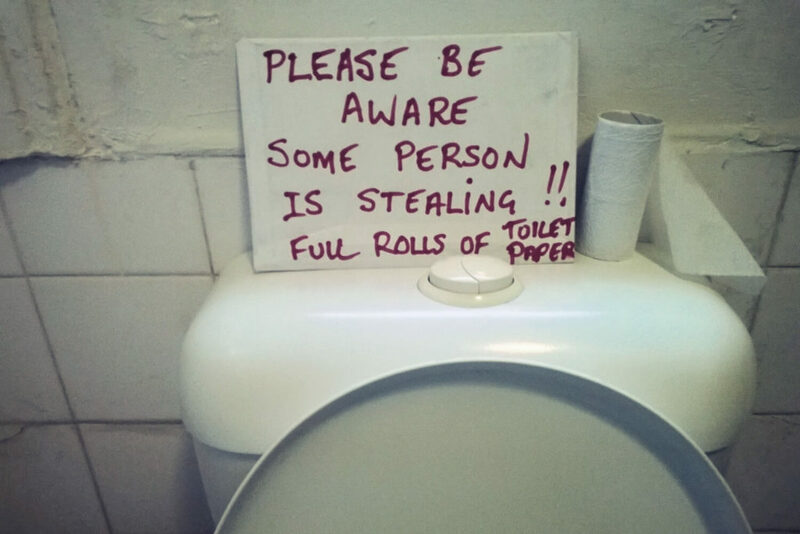 “[When I got two rolls from the library bathroom it was] a spur of the moment kind of thing. Once I got in there I remembered I was out and I’d rather spend money on other things,” said University of Florida senior Kaytee Allaben. “Wanna go out tonight?” your friend asks. You think of that hauntingly small number in your bank account, and know the only thing getting turnt tonight is you and your Ramen noodles. “[Not going out] doesn’t really help because I’d just buy alcohol to drink before [and] not being out makes you feel poor and lonely,” Allaben said. You constantly check Snapchat to see your friends’ shenanigans you missed out on. Damn—did they really get VIP at your favorite club? Hang in there, only 30 more days until your next financial aid disbursement. When all else fails and you find it impossible to save your remaining money, you take to the internet and try to sell as much stuff as possible. You become a master salesperson on Craigslist and eBay as you auction off your old Humanities textbook, fluffy prom dress, a broken toaster, a dining room set (there’s no shame in paper) and your beloved first iPod with “From Mom and Dad, with Love” chiseled on the back. You anxiously wait until you receive bids, and once they start coming in you sigh in relief because you know you can eat more than just a bag of pretzels this week. Unfortunately, no one wants your crappy iPod nano, but at least you sold your dress for $50. A plate of steak sounds like the right way to celebrate. Some of us can confidently forgo coffee, but when it comes to essentials like gas to drive to class, those coupons laying out in the student union you bypassed at the beginning of the semester look pretty good right now. When you have two dollars stashed away for your depressing dinner and your gas tank is on E, you shamefully ask your roomie if you can catch a ride. Even though many college students have no guilt mooching until they get their next disbursement of financial aid, life without funds is a dark, crazy place and there’s little you wouldn’t do just to make sure you can eat a measly granola bar for breakfast. *Name withheld to protect privacy.